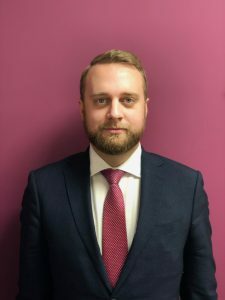 Callum started his legal practice working for a firm of claimant solicitors, qualifying as a Solicitor-Advocate in criminal and civil proceedings. He has since transferred to the Bar and has joined Central Chambers. Callum’s practice is primarily family law, he undertakes work in public and private law. In his public law practice he acts for local authorities, parents and children. With experience of matters including, domestic violence, neglect, drug abuse and vulnerable individuals. He acts in hearings at all levels, from EPO, ICO through to contested final hearings. His private law practice focuses on issues of contact, with experience of parents facing allegations of sexual abuse and domestic violence. He also has experience of cases with issues of relocation. He acts in hearings at all levels, from FHDRA through to finding of fact and final hearings. Callum also appears in cases dealing with matrimonial finances, from FDA through to final hearings. His criminal practice retains a number of Crown Court matters. He has acted in matters involving domestic violence, drugs, organised crime, driving offences and witness tampering. He is happy to accept work for both the Prosecution and Defence. In his previous life as a civil practitioner, he specialised in cases involving industrial disease specifically he has experience of neurological/vascular diseases, respiratory diseases and noise-induced hearing-loss. He has acted in high-value cases, including a group action of 35 claimants. In civil proceedings, he is happy to accept instructions from claimants and defendants on a CFA basis and prides himself on the quick delivery of his work. Callum takes a very analytical approach to his work. He is used to reviewing vast amounts of medical information to understand diseases and medical conditions; he applies this approach to all aspects of his work. He takes great care to ensure the needs of his clients are met and that they are guided through legal proceedings efficiently, without compromise. Re A Child (2019) – represented the father at an interim removal hearing involving allegations of NAI and FII, the court disagreed with the LA plan for removal and endorsed the the child remaining with the mother. Re A (2019) – private law matter representing the respondent involving allegations of sexual assault (acquitted in the crown court) all findings made of sexual assault made against the applicant. Re N (2018) – private law matter representing applicant grandparents alleged to have committed acts of honour based violence, allegations withdrawn after cross examination of the respondent. K v W (2018) re-established contact for the applicant after allegations of domestic abuse. Re B and M (2017) – Represented father in a private law matter involving allegations of harassment and domestic violence, allegations dismissed and contact put in place for father. M v A (2017) Lengthy finding of fact hearing over three days involving pending prosecutions. Primary allegations of sustained domestic abuse with a total of 14 allegations and numerous sub allegations. Six of the allegations dismissed on submission and a further two after hearing the evidence. R v Bushell (2018) – Defendant pleaded to Conspiracy to Convey a List A Prohibited Article into Prison, Perverting the Course of Justice, Possession with Intent to Supply (Class B) and Driving Whilst Disqualified, sentenced to 28 months custody. 15 months on remand as time served, the Defendant was subsequently released on licence. R v Suditu (2018) S.47 assault involving domestic violence. R v Sufi (2017) a case involving an assault of a severely autistic child in a hospital.